Linda at Girl with the Curlz emailed me about Home by the Seashore. So many cute nautical items! I think this pink and green lamp shade would look so cute in my room! 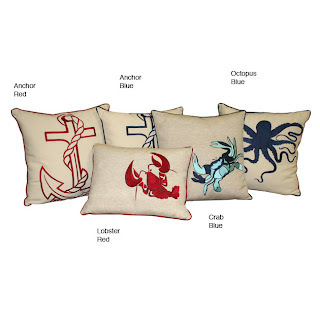 See something nautical you think I might like? Email me! I am also always looking for anchor photos to add to my Anchor of the Week sidebar feature. I always think of you when I see nautical anything, especially anchors. Now that my daughter is a Delta Gamma I will think of her when i see anchors too! I love the lamp shade! I really like the pillows! Thanks for posting the pillows! I did see them yesterday at TJ Maxx also! They are very cute in person. Those pillow are very cute! Your readers must love you, those all have your name on them! Did you see the Greenbeads sale on Gilt today? 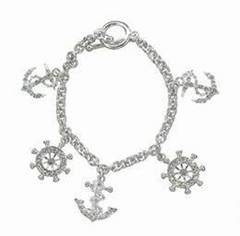 There was a beautiful gold anchor charm necklace on there and I thought of you! You know, I am just kicking myself because we drove by an enormous anchor statue last week & I neglected to take a picture.